Following our defeat on the frontier by the combined forces of Dautenstein and Zufluchtsort, the remnants of our army fell back north of the Dautenfluss. Grand Duke Rudolphus soon reclaimed both his capital and his principality (minus the pigs and clocks we had seized as war reparations). All though prior to this loss I had delivered nothing but success on the battlefield in the service of Margrave Maximilian, my failure was soon exploited by my political opponents—chief among them the Minister of Defence, Ritter von Rumsfeldt. The Margrave himself was unwilling or unable to see how his own hubris had caused us to overreach our limited military capabilities by annexing Dautenstein. Instead he flew at me in a rage, accusing me of gross military incompetence , insubordination, and inappropriate handling of state secrets. I was stripped of my command, and sent to southern Lützelhard to assume command of a training garrison. It was generally considered the least desirable assignment in the Army. 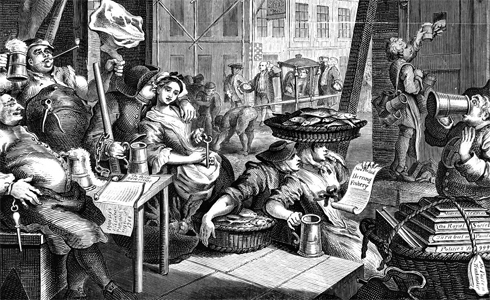 The recruits I found there were as rough and as uncouth as any I had encountered, much more inclined to drink and brawling than martial discipline. At least they knew how to fight, however. In this they were better men than any of the scheming nobles or politicians in the capital. I set about the task of forging them into a fighting force. As it turned out, my efforts were none too soon. 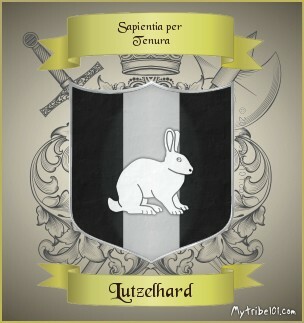 A mere three months after the Grand Duke had reclaimed his lands and title, he once more invaded beloved Lützelhard. This time it was clear, however, that our rapacious neighbour intended more than stealing pigs and modifying the border. This time he intended to take the capital, depose the Margrave, and annex OUR principality. I received message by courier that I was to march north to help defend the capital—more than a week away by the main road. Reports suggested, however, that the enemy would be at the gates much sooner than that. Was all lost? Perhaps not. While we could not arrive in the capital in time, we might be able to intercept the enemy’s forces en route if we took an alternative route—a narrow track that led directly through the dense forest of the Dunkelwald. At my disposal were a regiment each of untested Hussars and Dragoons, three newly-raised regiments of foot, an understrength Grenadier regiment consisting largely of aged veterans, two batteries of near-obsolete artillery, and a battalion of light infantry volunteers drawn from the doughty woodsman and skilled hunters of the Dunkelwald itself. “You can count on us, General!” said Draufgängerisch interrupted with an enthusiastic click of his heels. Having been exiled with me to the south, I knew the man was eager for any fight. “We shall set off at once!” His enthusiasm won over the doubters. 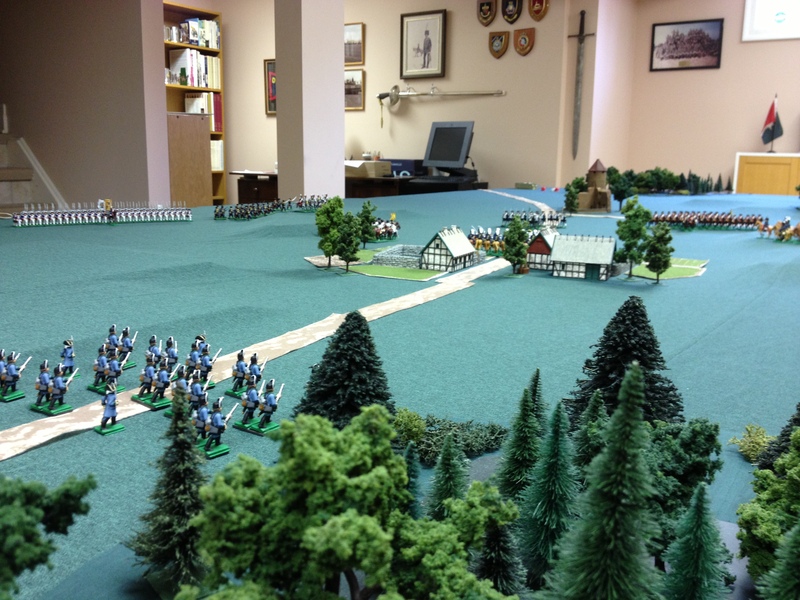 After three days the cavalry vanguard arrived at Walddorf to find it still unoccupied by the enemy. However, just north of the village our lead formation of Hussars spied a strong force of enemy horse. They were likely scouting ahead of the main body of their army—commanded, as in our previous encounters on the battlefield, by the wily General Alan von Scheunen. A second group of our Hussars spurred their mounts and galloped through the village to the cheers of the villagers. “Hurahh! Hurrah! Our pigs are saved,” they shouted as the brave troopers rode past, resplendent in their blue uniforms and polished buttons. 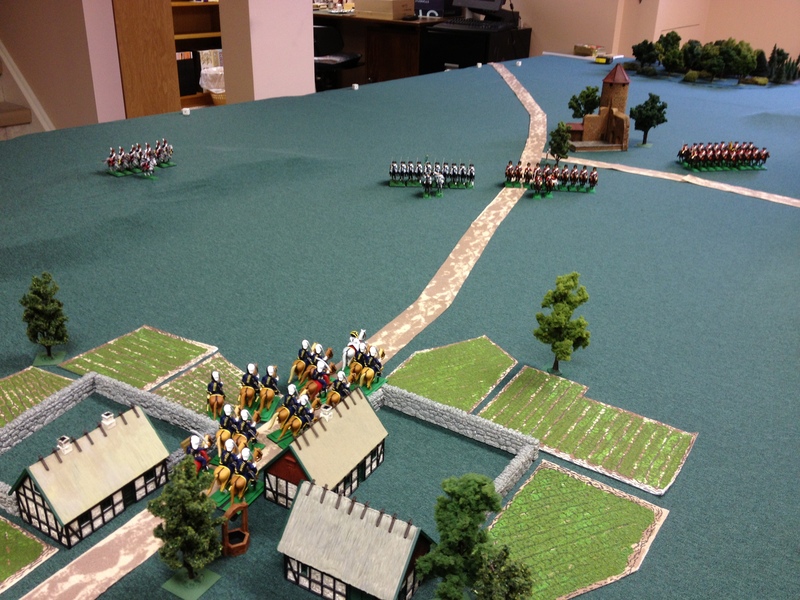 Meanwhile, Col. Draufgängerisch led the Dragoons around the west side of the village, placing his forces between Walddorf and the likely approach of the enemy main force. As the various formations of horse closed with each other, Dautenstein infantry could be seen advancing towards Walddorf in impeccably-dressed ranks. Fortunately, my own Dunkelwald Jägers, who had been screening our main force, arrived on the scene. The light infantry advanced with all possible haste in an effort to secure the village before the enemy could reach it. Close behind them followed the main contingent of our troops. I dispatched the 1st battalion of the Grenadiere des Südens and a battery of guns of the Schwerefeldartillerie-Battalion to secure a low hill on the southwest flank of the village. 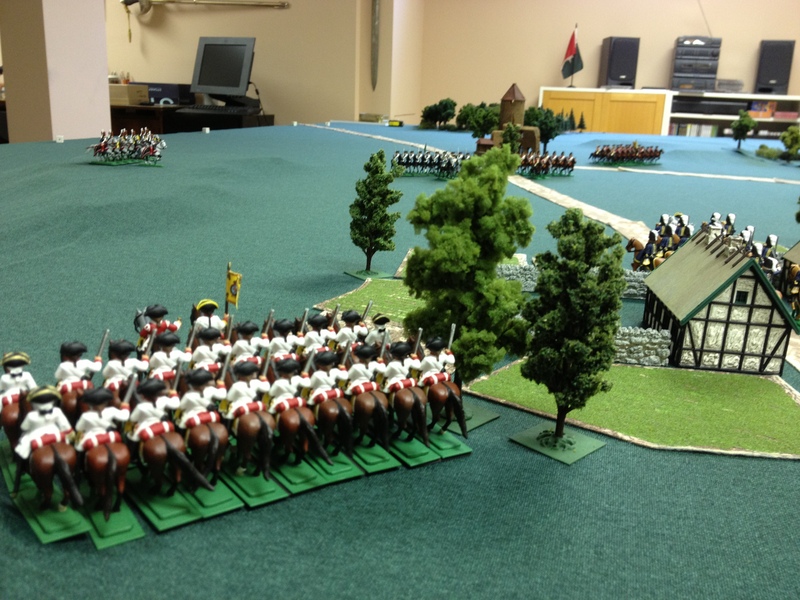 To buy more time for my main forces to arrive, the cavalry were ordered to engage the enemy. 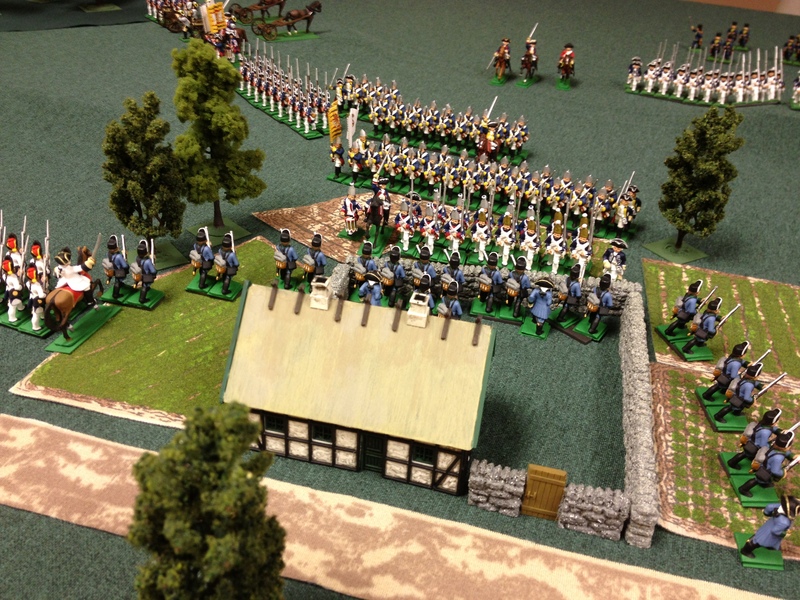 The Dragoons charged the Zufluchtsort Lancers and Dautenstein Horse Guards to their front, while the Hussars tried to scatter the enemy light infantry now advancing towards Walddorf from the northwest. A large group of enemy horse had forced two squadrons of Lützelhard Hussars to fall back east of Walddorf, and were now threatening to turn my right flank. However, as a series of swirling cavalry battle now began to develop north of the village they were drawn to that instead. Our artillery deployed quickly—clearly, their training had paid off—and they began to pound the approaching enemy. The Grenadiers moved to deploy beside them, thus securing my left flank which now lay anchored by the village on one side, and thick forest on the other. In the village itself, the Jägers took up position amid the buildings and stone walls, and started to fire upon the serried ranks of the Dautenstein infantry now advancing upon their position. The 4th and 5th Infantrie-Regiment Markgraf Maximilian von Lützelhard arrived to the battlefield, together with another battery of guns. The former were sent to strengthen the garrison at the village, while the artillery were ordered to the left flank to reinforce the Grenadiers. The 6th Infantrie-Regiment was still nowhere to be seen. While their commander would later claim they had been delayed by the difficult passage through the forest, I suspected that more than a few them had been drinking heavily in bivouac the night before and had started upon our route rather late in the morning. To the north of the hamlet, two squadrons of Hussars drove the enemy’s light infantry from a hilltop, only to be charged in turn by the enemy’s heavy cavalry. The remaining squadrons of Dautenstein heavy cavalry also joined the wild fray between my own Dragoons, the Zufluchtsort Lancers and Dautenstein Guards. 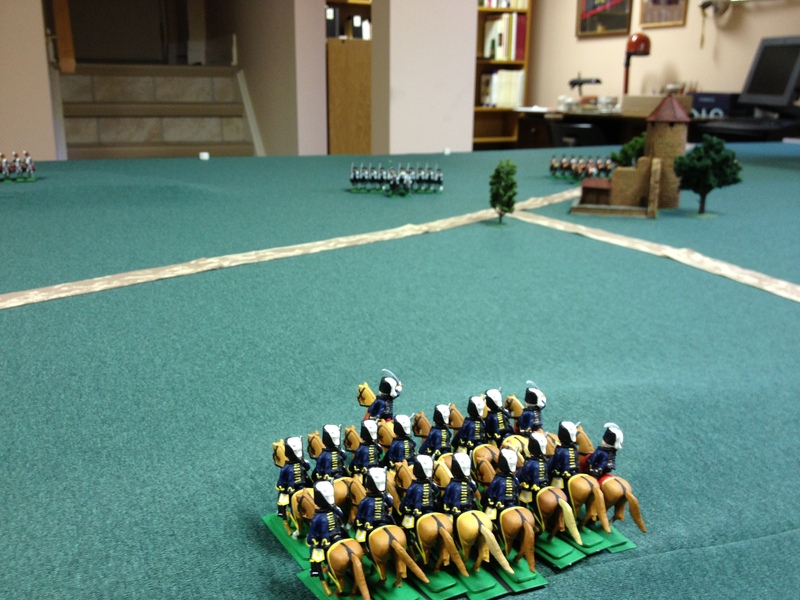 Not to be left out, my remaining Hussars also galloped forward to take part! The cavalry battle swirled on for more than an hour, with charges, counter-charges, rallies, and still more charges. At the end of it, the enemy was largely in command of this part of the field. Two squadrons of Lützelhard Hussars were cut down, and the survivors taken prisoner. The surviving squadron or so of my light horse withdrew to the hill east of the village. 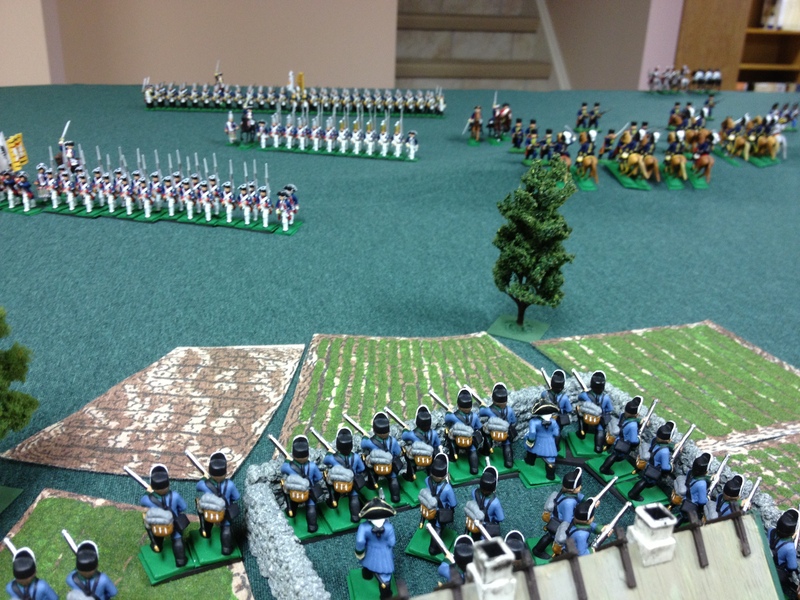 My Heavy Dragoons eventually withdrew from the field, badly mauled, but having successfully forced with withdrawal of the Zufluchtsort Lancers and Dautenstein Horse Guards. While the enemy still had a considerable force of heavy cavalry remaining, Colonel Draufgängerisch had done everything I had asked of him and his men: our brave troopers had kept the enemy at bay just long enough for us to secure Walddorf, and had bought the time needed for the rest of the Army to traverse the Dunkelwald. Back at the village itself, the enemy was preparing to storm our hasty defences. 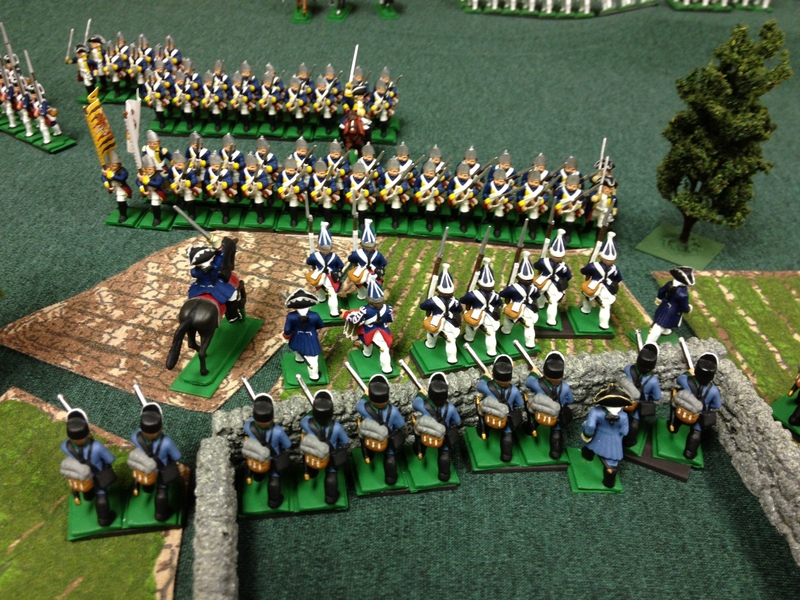 An elite Grenadier battalion led the way, charging the Jägers. They broke and ran, however, when confronted with rifle fire and cold steel by our stalwart lads. Truly the forests of Dunkelwald sprout not just mighty oak trees, but fearless men of iron too! Hurrah! Hurrah! As they did so, my opponent attempted one last assault on the village. It it too was thrown back. Hurrah! With more than half his infantry in retreat, von Scheunen began to withdraw from most of his positions to the southwest of Walddorf, consolidating a line farther to the north. I strengthened my position with additional reinforcements, including the belated 6th Infantrie-Regiment Markgraf Maximilian von Lützelhard which had finally arrived upon the field of battle. 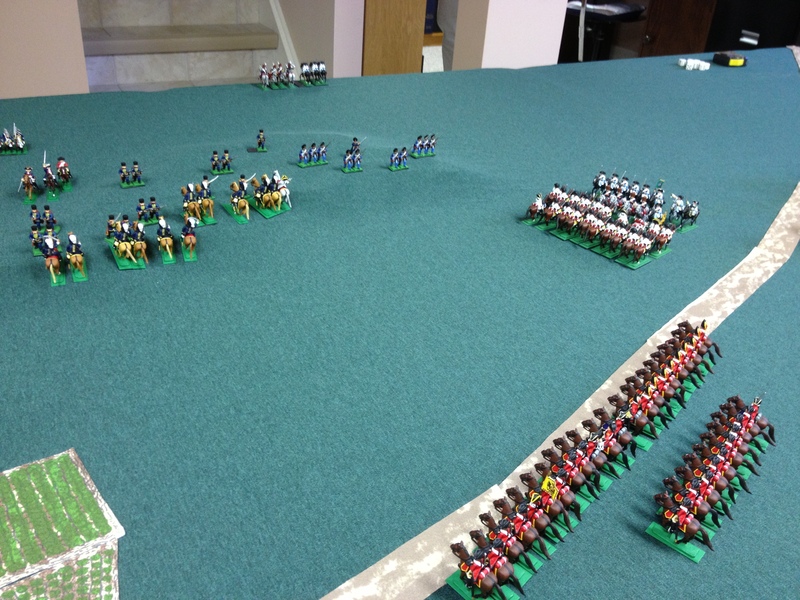 I had won a tactical victory against my opponents, although the bulk of his Army remained intact and in good order. 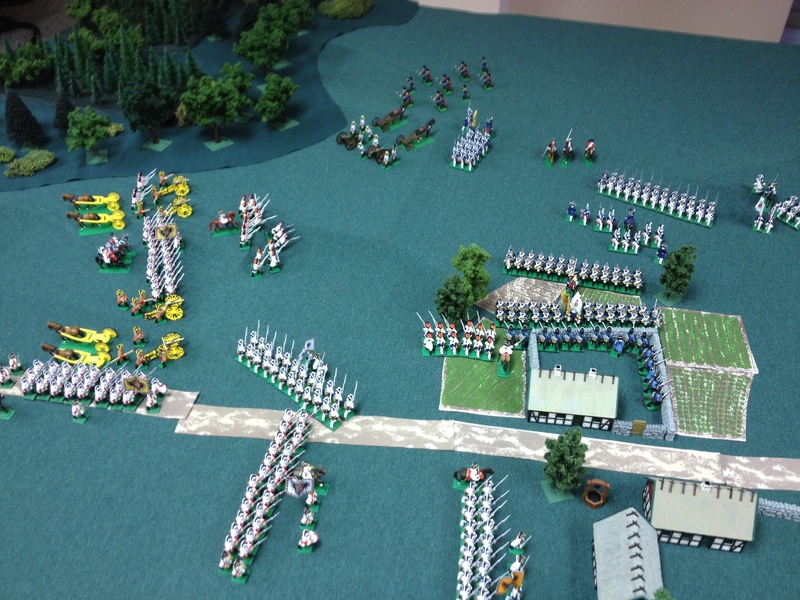 My casualties had been some five hundred cavalry, two hundred foot, and a few gunners, while I estimate my opponent had lost perhaps three hundred cavalry, well over a thousand infantry, and half a battery of guns. My army was now deployed beside the road to our capital. The accursed invader was left with two options: to retire back to Dautenstein in disgrace, or await reinforcements and launch an assault on the blocking position I had established. I sent a rider to the capital to inform the Margrave of our victory. I also ordered the engineers to begin work on field fortifications at once…. 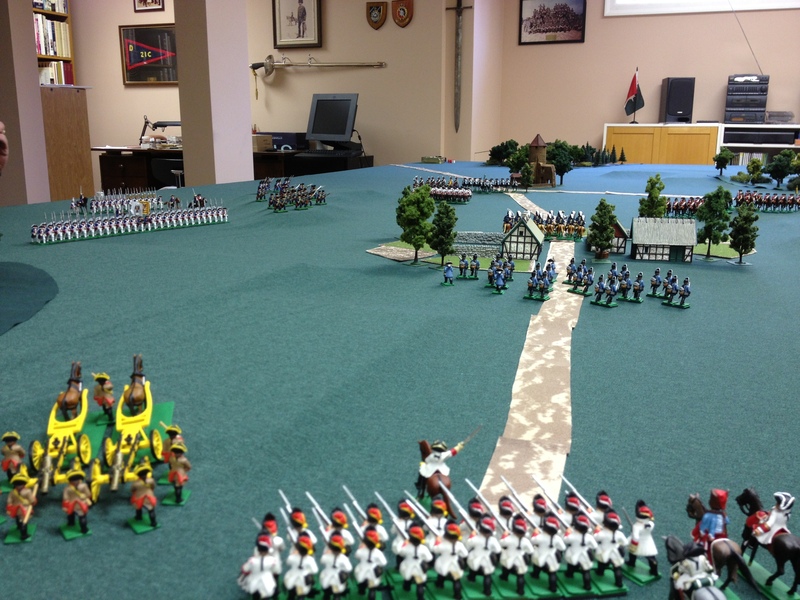 Two beautiful and impressive arrays, much eye-candy and a very enjoyable battle report; with an interesting campaign background: compliments and thanks for sharing! Great report. My favorite part: Truly the forests of Dunkelwald sprout not just mighty oak trees, but fearless men of iron too! Hurrah! 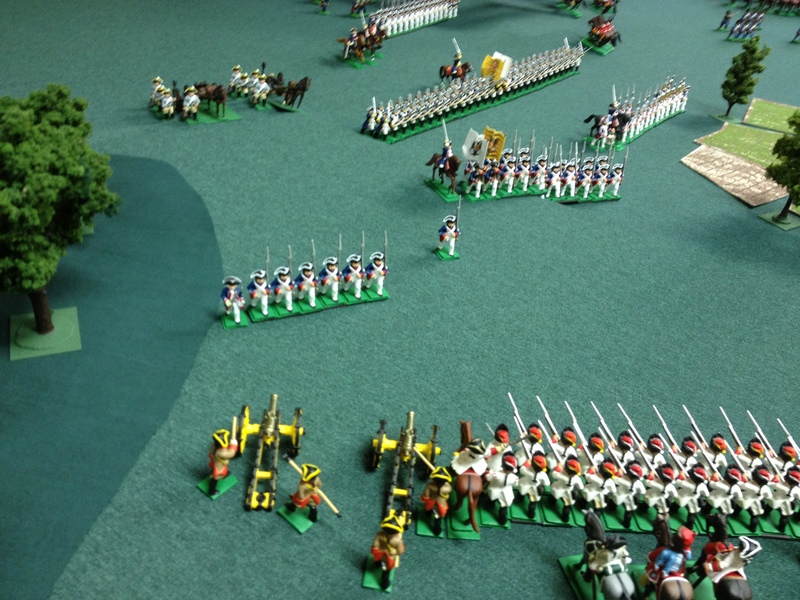 A marvelous battle report, with a *lot* of eye-candy: Old School Wargaming at its best! Now -I just checked- some 7 months flowed by since the previous battle report: to help us waiting for the next AAR, could we hope for a detailed parade of the armies involved , each regiment presented in turn? Lützelhard looks very Austrian (with glamorous ‘Funckenian’ jaeger in light blue) and Dautenstein very Prussian; as for Zufluchtsort its forces seem to be strong in Bosniacs and Croats? Well-spotted, Jean-Louis! The troops aren’t mine, but I’ll pass on the request.